Stand out. And get buyers in. Getting the most for your home or property means doing more than putting a "For Sale" sign out front. In a competitive market, new homes for sale are added daily, and your listing needs to be seen in a variety of places in order to stand out. Often, the right buyer is waiting in another neighborhood, city, or even in another state or country. To be sure your golf course home gets noticed and sells for the greatest value, work with the experts. 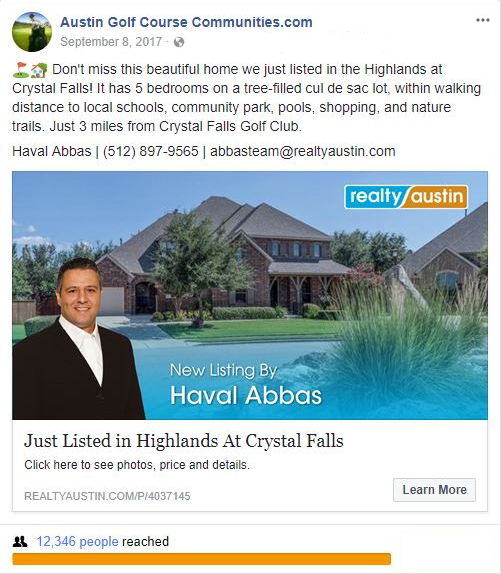 The Abbas Team at Realty Austin specializes in golf course real estate and we'll work with you to get your house sold. As your listing agents, we'll provide detailed market research to help you determine the best price for your golf course home. Our market analysis covers home values throughout your area, including sold homes, expired listings, and properties still on the market in your neighborhood and in similar golf course communities throughout the Austin area. Request a free market snapshot for your home today. As we get ready to list your golf course home, we'll help you identify cost-effective steps to get your home ready to sell. Whether your home needs just a bit of paint and polish to be in showing condition, or you need inspection, repair, landscaping, staging, or remodeling services, we can suggest professionals to help you get it done. Then, we'll work with you to gather all of the necessary paperwork for your listing, including your property survey, homeowners' association documents, and any required state and federal disclosures. We'll work with you to develop a customized marketing plan to emphasize your home's best attributes. We'll take professional photos and get your home in front of buyers on AustinGolfCourseCommunities.com, on RealtyAustin.com, in the local MLS, and on all the nationwide websites where buyers are looking. We'll also leverage paid and organic social media posts on platforms such as Facebook and Instagram. With more than 80 percent of conducting their home search online, you need a real estate team who understands digital and social marketing. Negotiation is one of the most important services we offer, which is why we'll work with you to prepare a negotiation plan upfront. Whether this is your first home sale or your twentieth, we'll review the Texas purchase contract and addenda with you in detail. We'll discuss the terms we expect buyers to ask for and how we plan to protect your interests and help you get the greatest return. Then, when you start to receive offers, we'll represent you during the emotionally-charged negotiating process and ensure that you get the best possible price and contract terms. We also take care of all paperwork related to the sale and coordinate with the buyer's agent, lender, inspector, homeowner's association, and title company. We'll stay in touch and answer questions to help you and your buyers meet timelines defined by the contract and ensure the escrow process runs smoothly. What's Your Home Worth? Request a free market snapshot or complete the form below to learn more about selling your golf course home.